MarCO-B captured this image of Mars shortly after NASA's InSight lander successfully touched down on the Red Planet. The first small spacecraft to ever leave Earth's orbit have been silent for more than a month, NASA said today (Feb. 5) in an announcement about the pair of Mars Cube One (MarCO) probes. The two MarCO spacecraft (called, specifically, MarCO-A and MarCO-B) launched in May with NASA's InSight lander as a demonstration project. The mission was meant to show that the small satellites that have proliferated over recent years could survive and conduct useful science beyond Earth's immediate neighborhood, and the MarCOs achieved every one of their goals, NASA said. "This mission was always about pushing the limits of miniaturized technology and seeing just how far it could take us," Andy Klesh, the mission's chief engineer at NASA's Jet Propulsion Laboratory, said in a statement. "We've put a stake in the ground. Future CubeSats might go even farther." The InSight lander could complete its own mission without its two small companions. But they were designed to relay information about the perilous landing to NASA's engineers faster than other communications systems at Mars could do. And within just minutes of the scheduled touchdown on Nov. 26, the MarCO satellites sent home word that InSight had safely landed. 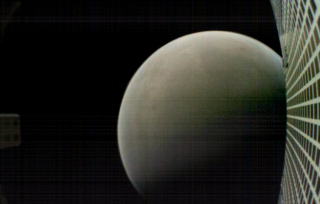 One of the cubesats, MarCO-B, also captured incredible pictures of Mars itself as the tiny pair flew by the planet. The $18.5 million mission met all its goals on landing day, even as the spacecraft themselves barreled past Mars. They also captured hearts on their daring adventure, with MarCO-A nicknamed EVE and its partner called WALL-E, in honor of characters in the animated film "WALL-E."
NASA estimates that MarCO-A, which last phoned home on Jan. 4, is now nearly 2 million miles (3.2 million kilometers) beyond Mars. MarCO-B, which has been silent since Dec. 29, has traveled about half that distance past the planet. Plenty of threats could have felled the two interplanetary spacecraft for good, but just in case they're still out there, NASA will ping the cubesats again in the summer, when their orbits carry the MarCOs closer to Earth. And in the meantime, NASA has plenty of plans to design additional small spacecraft, building on the legacy of the first interplanetary cubesats.